Zinburger Wine and Burger Bar recently hosted their 3rd Annual Create Your Own Burger Contest. Fans were invited to submit their burger ideas on Zinburger’s Facebook page. Three finalists were selected and voted on by the fans of the page. The three finalists were the Ultimate Korean BBQ Burger, Honolulu Baby Burger and Southern Swag Burger. 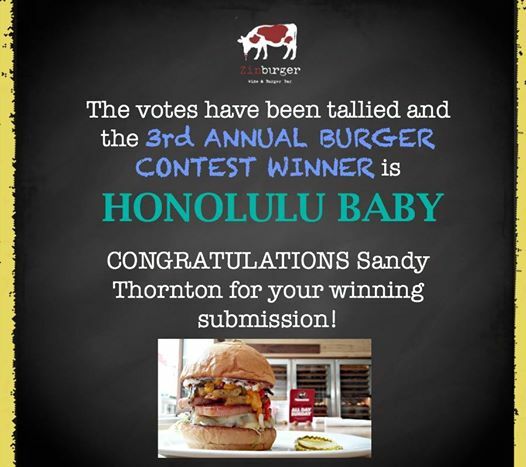 On September 3rd it was announced that the Honolulu Baby Burger, burger brainchild of Sandy Thornton of Atlanta Georgia, had won the contest. The Honolulu Baby Burger consists of certified angus beef, Swiss cheese, charred pineapple, fire-roasted red and yellow bell peppers, shredded lettuce, mayo and topped with a grilled square of SPAM. That’s right, folks, SPAM! Talk about over the top! The burger will be featured on the menu of Zinburger’s East Coast restaurants this week; September 15-21 only. We were invited to preview the burger yesterday at the Cherry Hill restaurant located at 923 Haddonfield Road. We graciously accepted the invite to try this indulgent creation. We have been to the Cherry Hill location a few times and were always pleased with the quality of food and service. We were greeted promptly by a hostess and the manager on duty that day, Giorgios, escorted us to our table. Within a minute our server, Ryan, arrived to take our order. Naturally, we were there for one thing, the winning burger. But we also selected an order of their amazing hand-cut fries and onion rings. We had the fries before and were already in love with them, but not the rings. We’re often hesitant to order onion rings because they can come out too greasy and the breading can fall off which is not conducive to good onion ring eating in our opinion. Zinburger’s onion rings are perfect. You get the full onion ring experience with the breading staying in tact. The BBQ sauce while good, probably isn’t necessary. It was hard to not to eat all of them as we easily could have, but we were purposely conserving our appetite for the main course, especially in light of knowing how utterly decadent it would be. We both ordered our Honolulu Baby Burgers medium-rare. And that’s exactly how they came out; brown on the outside and a delicate red-pink on the inside, and mouthwateringly juicy. Kudos to the burger chefs who can nail it! We’re not going to lie: this burger is NO joke! In fact, it’s pretty overwhelming. The picture above doesn’t do it justice, it is quite large. The kind of burger you need to cut in half to eat it carefully and diagnostically. The full impact of the savory experience didn’t register until after a couple of bites. Then when all of the flavors come together, you can’t help but moan joyfully and become somewhat involuntarily compelled to continue eating. This burger has pronounced flavor notes; savory, salty, and sweet. But certainly not too sweet. Chargrilling the pineapple and roasting the peppers really does temper overt sweetness. The SPAM, while a novel and nostalgic addition, didn’t take away from the burger. In fact, we hardly noticed it. It was a labor of love, but we were able to (mostly) finish our burgers. The only very minor issue we had was that there was slightly too much mayo producing slippery conditions and some of the ingredients to end up on the plate. No worries; that’s what forks are for. In the end, we felt that the food hangover we had for the rest of the day and risk of heart attack (we kid, sort of) was completely worth it. This is a burger for the ages, foodies and burger lovers. One that must be experienced to be believed. Totally worth crossing the bridge for it. We sincerely recommend visiting the Cherry Hill Zinburger this week to try it yourself. Not only do you get to sample a one-of-a-kind, limited edition burger, but you will absolutely be treated to wonderful and prompt service, delicious sides (get the rings!) and super tasty beverages. This week’s milkshake is the Snickers, but they have many, many other milkshakes to choose from. They also have many great wines (as their name suggests) and other alcoholic offerings at a full-service bar. If you’re lucky, Ryan will be your server. Ask for him; you won’t regret it. Thank you Sandy Thornton for the outrageously delicious concept. As always, thank you Zinburger Cherry Hill for another incredible burger encounter; til next time! Previous post ← 4th of July Cocktails Anyone?